Up to 3,000 Avios for Hilton Stays: Members of British Airways’ Executive Club who are also members of Hilton HHonors and who stay once before the end of 2013 will earn between 1,000-3,000 Hilton HHonors points. The number of bonus Avios you get is based on your Executive Club tier status at the time. 1,000 Avios for Blue members, 1,500 for Bronze, 2,000 for Silver and 3,000 for Gold members. Only stays booked after registration will be eligible for bonus Avios. HHonors members choosing Fixed miles award will earn 500 base Avios per stay and the appropriate bonus Avios based on their Executive Tier status at the time of the first stay. HHonors members choosing Variable miles award will earn one Avios per USD spent and the appropriate bonus Avios based on their Executive Tier status at the time of the first stay. Customers must be an HHonors member to earn bonus Avios. Hilton HHonors members must have their earning preference set to ‘Points & Miles’ and must have ‘British Airways’ as the preferred airline partner. 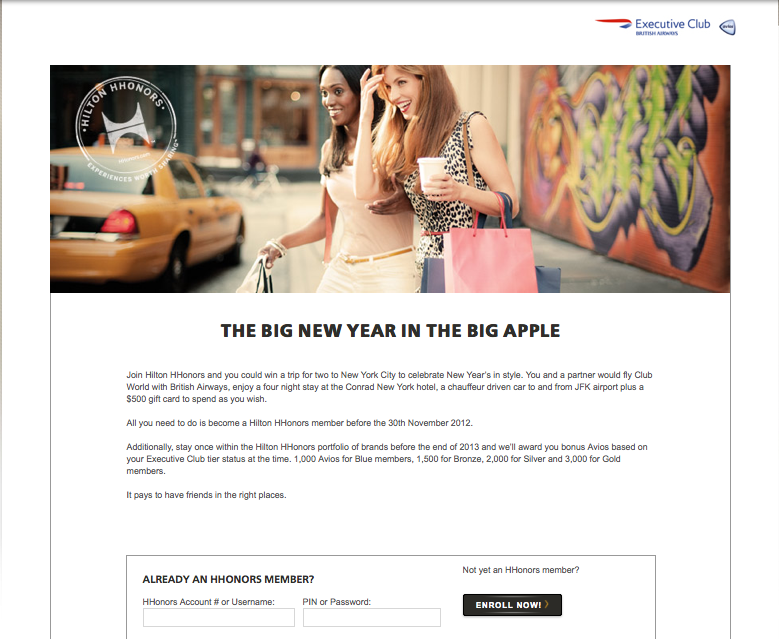 Additionally, if you are new to Hilton HHonors and join before November 30, 2012, you could win a trip for two to New York City to celebrate New Year’s in style. You and a partner would fly Club World with British Airways, enjoy a four night stay at the Conrad New York hotel, a chauffeur driven car to and from JFK airport plus a $500 gift card. Skype if offering one month free of unlimited calling. One Month Free of Skype Calling: Skype is offering unlimited free calling for an entire month. In addition to making free Skype to Skype calls, you can call offline contacts on their mobile phones and landlines. The deal includes one month of free unlimited calls, calls to mobiles in seven countries, including the USA, Canada and Hong Kong, unlimited calls to landlines in over 40 countries and no contractual obligation. You can try it for a month and cancel at any time without being charged. The trial offer must be redeemed by November 15, 2012, and is available only to existing Skype users who have been registered with Skype more than 29 days. So, if you don’t already have a Skype account, you can sign-up for a free one, and the next time they run a special, you will be able to take part. LANPASS upgrades will only be available for elite members. LANPASS Changes Upgrade Redemption Rules Change: LAN’s frequent flier program, LANPASS, is making some changes when it comes to redeeming upgrades. As a reminder, currently you can use your LANPASS Kilometers to redeem upgrades for a higher service class (Premium Business or Premium Economy) on LAN flights once you have purchased a ticket in Economy class. However, starting November 1, 2012, redeeming upgrades using LANPASS Kms will only be available as a benefit for LANPASS Elite members with Comodoro, Premium Silver or Premium status. These elite members will also be able to redeem these upgrades as far as six months prior to the flight’s departure date, subject to availability. You can learn more details about this benefit and the rest of the negative changes here. New Priority Pass Lounges Added: Priority Pass is a network of over 600 airport lounges worldwide that you can purchase membership in, or that you get for free with the American Express Platinum card. In addition to some independent lounges, Priority Pass also contracts with certain airline lounges, and its list of partner lounges is constantly growing-adding 10 new lounges during September and October. The new ones to join include Air Canada’s Maple Leaf Lounge at LGA which is located in Terminal B so passengers on American, JetBlue, Southwest, Frontier, and United will all be able to access the lounge. Other ones joining are The Avia Lounge in Rome (FCO), 4 lounges at Peru’s airport including Sala VIP Lounge, and Caral VIP lounges. In Paraguay, the TAM Airlines Salon VIP lounge now welcomes Priority Pass members. You can search Priority Pass’s entire directory here.